A few years ago before I met D-Money, I dated this guy, Mr. Box. Looking back, I knew Mr. Box and I would never actually end up together; he made fun of my choice of music (I was totally into that TicTok song at the time so maybe I deserved it), his parents didn’t like me (it was a race thing… totally not okay), he didn’t really like my friends (they are awesome) and he didn’t compliment me enough (I need constant praise and attention… kind of like a puppy). However, our relationship made sense at the time; I was 20 and it was fun having someone to hang out with and mack on. Mr. Box is the reason I was a V-Day hater for so long. On our first (and only) V-Day together, he made dinner reservations with another couple. I was instructed to dress up and be ready for a great and romantic evening. I follow instructions well. I was dressed, makeup and hair were done and I was wearing my party shoes. Mr. Box comes over to my dorm (late) and he was not dressed up. I knew something was wrong. My heart instantly sank. He simply says, “I can’t.” Confused and outraged I start crying and asking “what is going on?” All he can say is, “I can’t.” He leaves for a second and comes back with a box full of my things… things I had gotten him and things I had left at his place like my hoodies and running shoes. Awesome. That’s why he is called Mr. Box. He broke up with me on V-Day with a box full of our memories. Sadly, my roommate wasn’t there to comfort me. I had to fend for myself, which meant getting drunk, eating the chocolates I had bought for him and going to watch “He’s Just Not That Into You.” It was the worst Valentine’s Day ever. Now when I tell the story, I laugh because it is sort of hilarious (in that kind of painful way). I got dumped on V-Day. With a box full of my things. It sounds like it was taken from a really bad romantic comedy. I wish I had known about these cupcakes. I would have made them and eaten the whole batch. 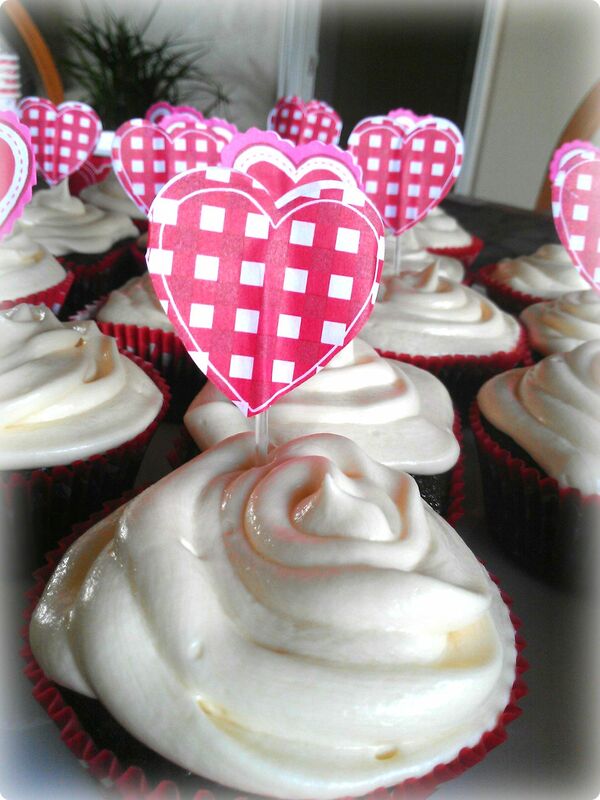 They are great for Valentine’s Day but seriously great for any and everyday. Share them with your friends and family and please, do not break anyone’s heart this V-Day. 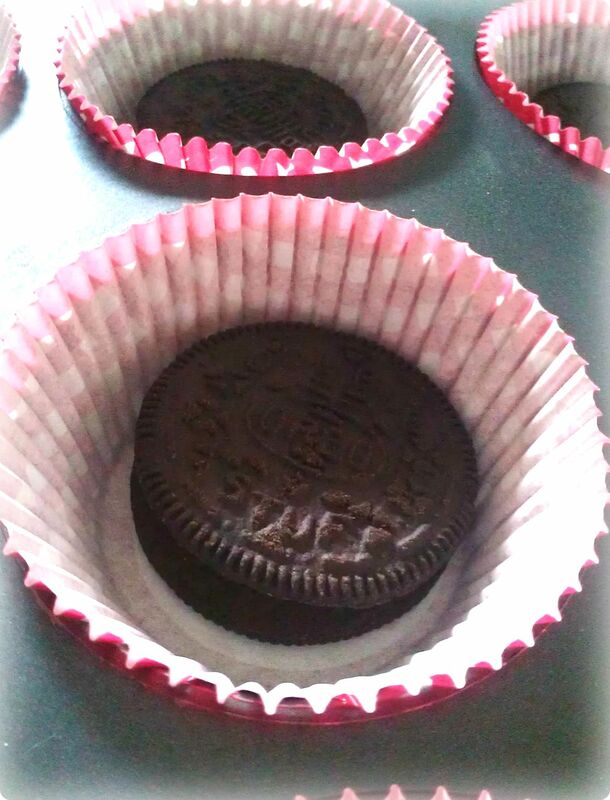 Preheat oven to 350 degrees and line a muffin pan with cute paper liners and place an Oreo in each one. Whisk together the soy milk and vinegar in a large bowl, add the sugar, oil, vanilla extract, almond extract and banana extract to the soy milk mixture and beat. In another bowl, mix the flour, cocoa powder, baking soda, baking powder, and salt. Slowly add the dry ingredients into the wet ingredients and mix until uniform. 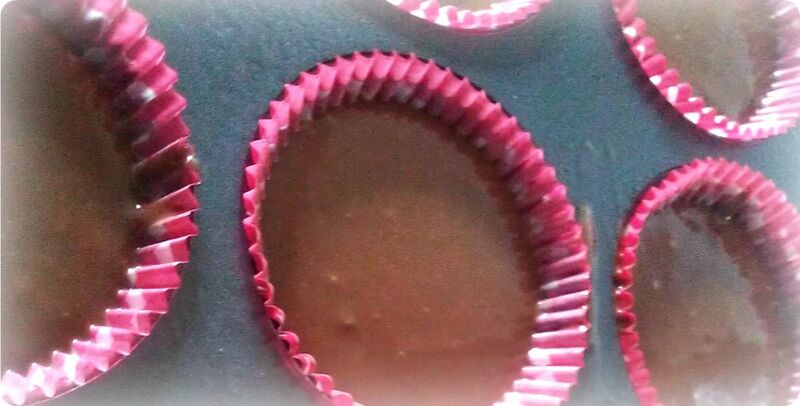 Pour the batter into the liners on top of the Oreo (I made circle and square cupcakes). Bake 15 to 20 minutes. Let cool completely. If you are not a frosting person, you can stop here. They are magical without the frosting as well. Using a hand mixer, mix the shortening and margarine together and add the sugar, vanilla extract and soy milk, and mix for another 3-5 minutes. Now spread your frosting over the cupcakes and decorate them. The best part about these cupcakes is that you can lick the bowl sans worry. 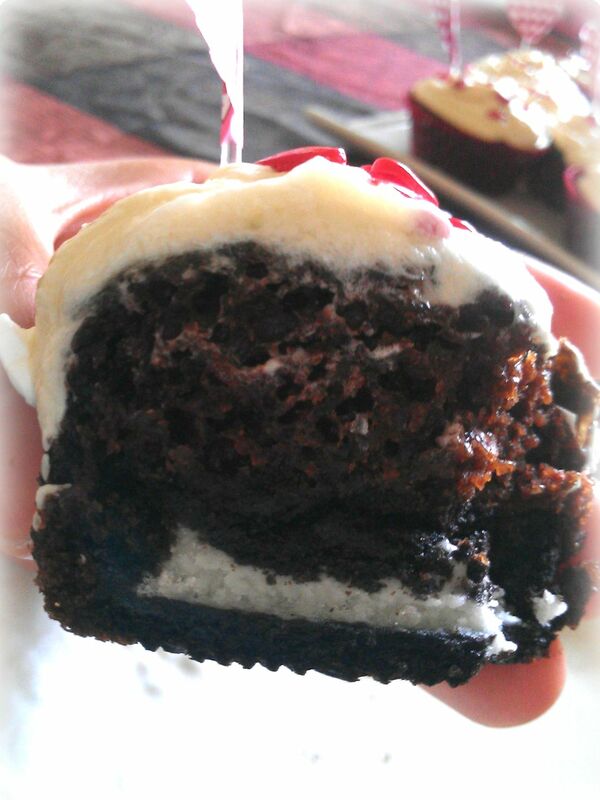 The people who are lucky to get a cupcake from you will love the surprise of the Oreo (Oreo’s are vegan! Who knew) inside. What’s your worst Valentine’s Day story? 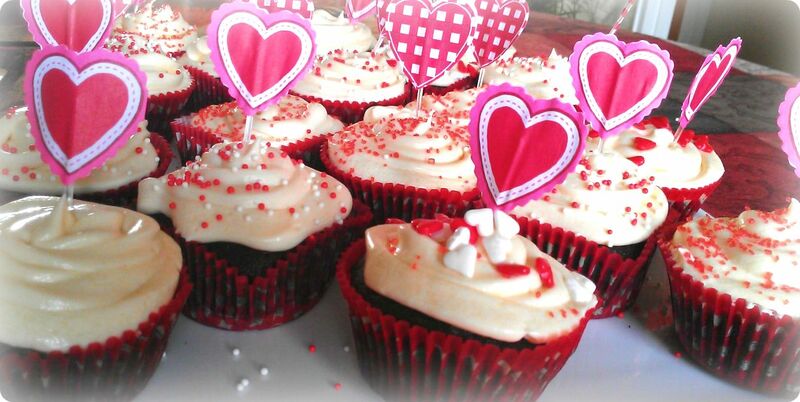 Those cupcakes could get anyone through any break-up – they look great – I also can’t wait to try the vegan frosting! I wish I knew about them during the break-up, they definitely would have helped. 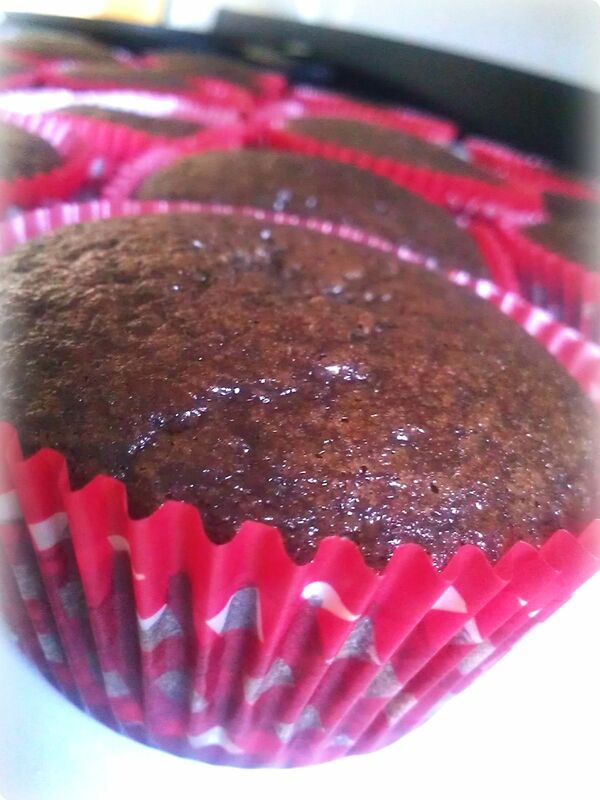 I look forward to hearing what you think of them and the frosting, they will soothe any sweet teeth you may have. OMG I’m going to start CRYING!! 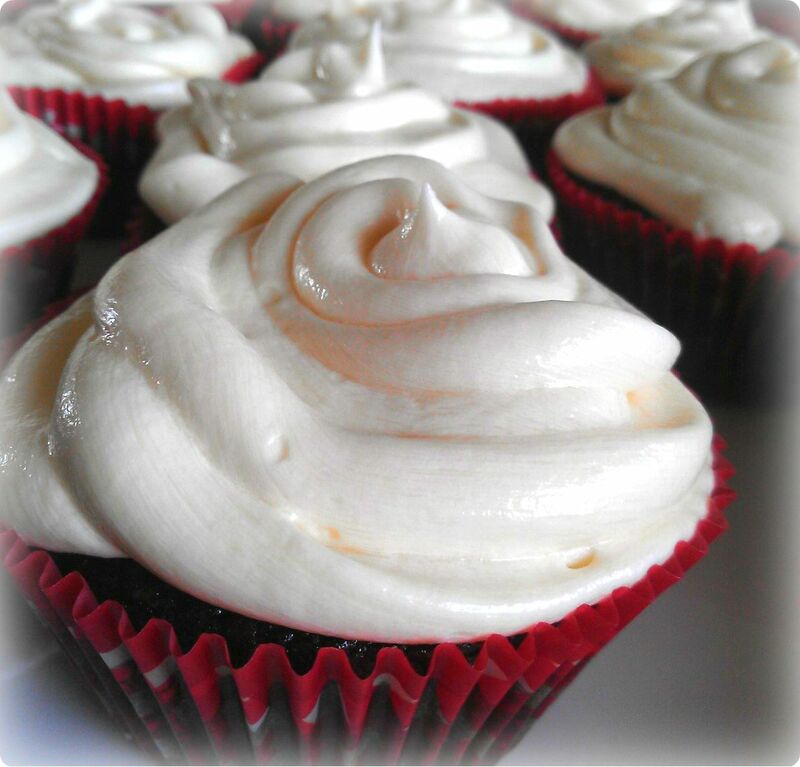 Your cupcakes look amazing and I want to make them- they are wonderful. BUT I WAS THE ROOMMATE THAT WASN’T THERE!!! Omg omg omg worst friend ever! And “Mr. Box” (I like this pseudonym btw) was the worst bf ever!! Omg what a terrible time. I hope this Valentine’s Day is a MILLION times better than that one was!! 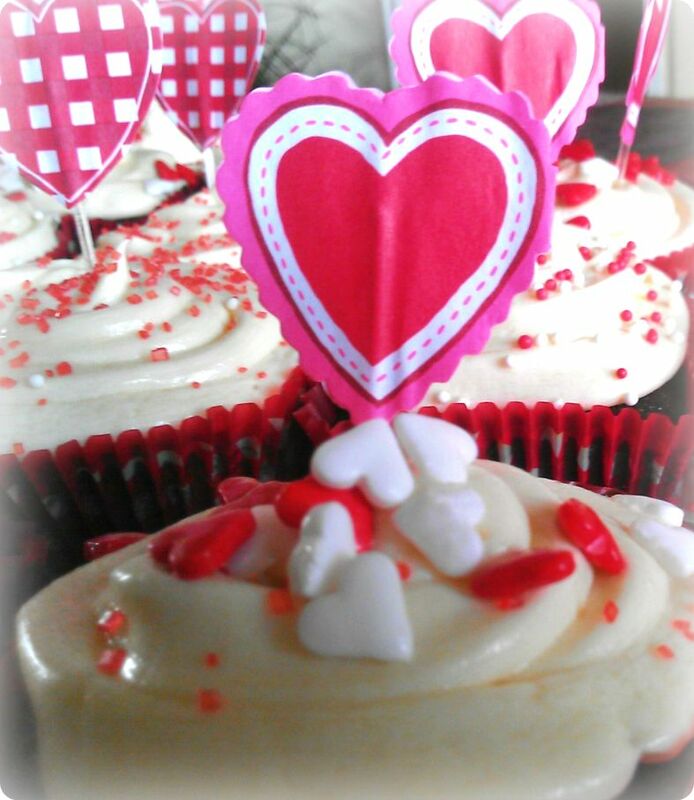 I have also been dumped on Valentines Day… I was 15 though, so I’m not sure if it really counts :P. Love your cupcakes, they looks delicious!